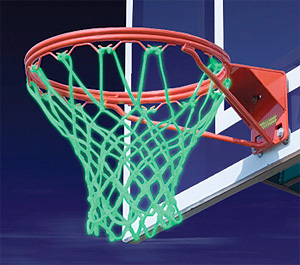 Glow-In-The-Dark Basketball Net For Your Midnight Hoop Dreams | OhGizmo! If you have dreams of one day making it big in the NBA/WNBA, you can’t stop playing basketball just because the sun’s gone down… and the streetlights have all burned out… and the moon has disappeared. Not at all! You have to keep practicing until the wee hours of the morning, and the only feasible way you could do that is with this glow-in-the-dark basketball net. After a day in the sun the Nite Hoop will glow for a good 8 hours, so the only thing stopping you from honing your skills all night long is your neighbors getting angry at you for playing basketball at 3 in the morning. $32.98 from Things You Never Knew Existed. I could see the Harlem Globetrotters using this, but other than that, really?